The client’s brief was to adapt, extend and refurbish this 3 storey Victorian end-of-terrace house to suit their busy family’s need. 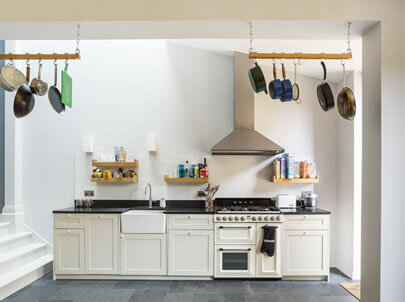 The Victorian rear addition was remodelled, and a slate-clad loft extension added, to accommodate two additional bedrooms, a second bathroom and a small utility room. The kitchen was extended to the side with a focus on family living, providing lots of space around the dining table and a small but hard working kitchen. A large skylight brings daylight into the kitchen and the adjacent living room. The property’s end-of-terrace situation made it possible to achieve a generous height within the ground floor extension, adding to the general feeling of space. A full height glazed door and a large sliding window connect the kitchen/dining room with the patio garden to the rear. Internal finishes include black slate floor tiles and a granite kitchen worktop.